Best climbing frames for toddlers and kids in 2019 – Get Kids Outside! If you have the garden space a climbing frame is a great investment. Kids just love to climb and explore their limits. Safety precautions must always be at the forefront of your mind when buying and investing though, so here are the best climbing frames I’ve found on the market in 2018 for toddlers, kids and even older kids! If you haven’t time to read the whole guide then do take a look at my best all round choice which is the TP Explorer Climbing Frame – you can see it on Amazon here. 3.1 TP Explorer Climbing Frame – my best choice! 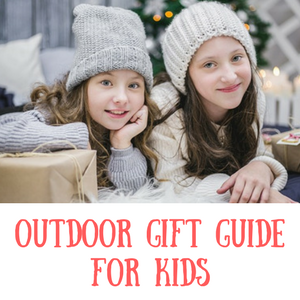 When looking at all these points, perhaps you’ll want something that will last all the way from a toddler age all the way to older child, or perhaps you might just have the space for a small toddler climbing frame that you want to bring inside in the winter and you’ll be looking to invest in a larger climbing frame in a few years. Many of the climbing frames in the other categories, including my best pick, are suitable from a young toddler age, so do look at those as well. Toddler climbing frames tend to be much smaller and plastic which has the added benefit of them being easier to move around and if you have space they can even come indoors on wet and cold days in the winter which means their play can get massively extended. One of the best plastic climbing frames for toddlers is this one by Little Tikes. The design has been going strong for many years now, certainly since before my teens were toddlers, so you can be assured that it’s a good one and built to last. These climbing frames are easy to assemble and not so big that you’ll be worrying about if they fall off it. The play value is immense, it’s a plastic climbing frame with slide attached, spaces to crawl through and of course plenty of bits to climb over! It’s brilliant for wearing out toddlers and as mentioned above and it’s small enough that it could definitely be used inside as well. It’s suitable from the age of about 18 months to 4 years old and is a reasonable price should your budget not stretch to some of the larger climbing frames around. Little Tikes toys always have a good resale value should you want to sell them on when your kid gets a bit older. TP Explorer Climbing Frame – my best choice! This is my best choice out of all the products. TP is an excellent brand with many years in the business so they are well established. We’ve used this one ourselves and found them to be a great choice. They make this as a base metal climbing frame and it’s perfect for small gardens on its own or you can add some of the extras on to it if you have a bigger garden. You can get monkey bars (the jungle run) and a slide which make it a much bigger option (can be bought as a whole or separate), but just the base set is excellent on it’s own in my opinion. The reason I like it so much is for the added den at the top which just makes a great place for kids to sit outside and enjoy the world going by. They can use it to spy on nature, have picnics, read a book, anything! Another great idea from TP is this climbing dome. It’s like all those monkey bars that you see in play areas but on a smaller scale and suitable for gardens. Perfect for toddler kids who just want to climb and swing, it’s even good for a couple of children to play on at once so if you have more than one it could be good for you. It also comes with an app designed for it to add another layer of fun for your child. If you’re considering a geodesic climbing dome for your kids then your might find that you’d prefer a metal frame. This does increase the price but will make for a much sturdier and more longer lasting item. This climbing dome from Plum is a really fab item – it looks amazing in the garden and just invites children to come and climb on it. This one also includes a platform and slide as well for some added play value which I think is great. It’s suitable for ages 3+ and up to 50kg. A slightly different option for older kids are these horizontal gymnast bars. It would be perfect for any kids who also do gymnastics or just kids who like to climb and swing about. This set is a single bar set but you can buy a larger set and have the heights set differently so that kids of different ages can use them. They’re really a fun idea and can certainly help to get your kids more active. It does need set in concrete so requires a bit of planning but for the price it’s an excellent bit of kit. 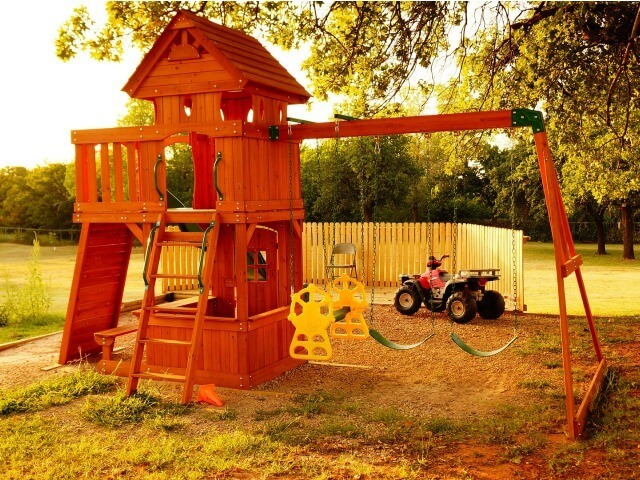 Wooden climbing frames can be a really good investment – they can last for years if you choose wisely. They are at the higher end of the budget compared to plastic and metal versions but sometimes nothing beats wood outdoor toys! It’s recommended for ages 3 – 12. This is a perfect wooden climbing frame for older children as it’s suitable up to the age of 14 and so you’ll likely get many years of use out of it. It consists of monkey bars, a swing and a slide with a covered den part at the top. You get to the slide by climbing up a climbing wall. 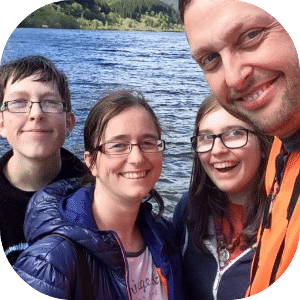 It’s a great option if you are looking for something for multiple kids to play on too as it can suit up to four kids playing at once (although only one on the platform at a time).